Coloring eggs for the Easter celebration is a tradition with roots that some historians believe can be traced to ancient Egypt. At least a tradition similar to the modern practice was present in the days of the early Christians who stained eggs red to symbolize the blood of Jesus Christ. The folk custom of dyeing eggs in festive, bright colors may be an adaptation of pagan fertility and rebirth celebrations. 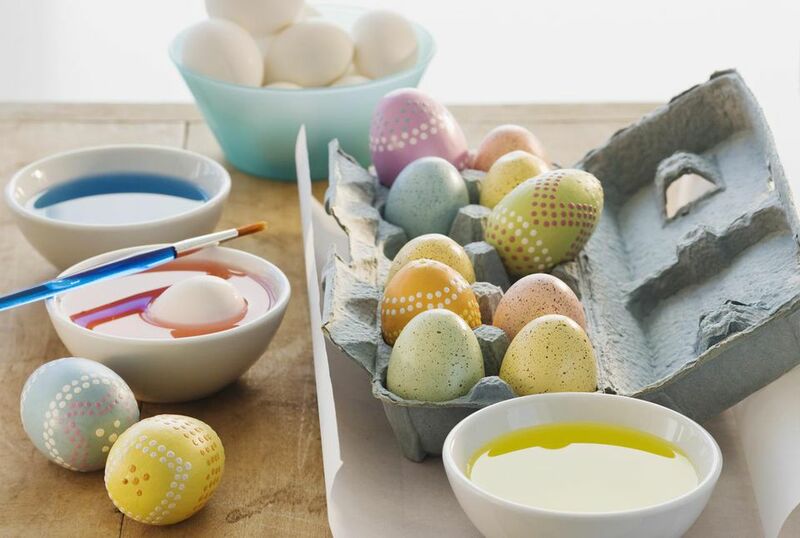 Over time, the Christian Easter celebration is thought to have absorbed festive aspects of local pagan ritual, which celebrated the rebirth of nature in springtime by dyeing eggs in bright colors. Place one teaspoon of vinegar in each container. Add about 1 1/2 cups of hot water (hot tap water is fine) to the vinegar. Add a few drops of food coloring to each container. Ordinary food coloring will do, but you can also buy dyes specifically intended for eggs. Unusual colors can be created by mixing different food colorings in different ratios. For example, you can create teal by mixing 12 drops of green with eight drops of blue. Just be careful not to wind up with muddy, gray colors. Make the dye by chopping or mashing the vegetables and combine with 4-6 cups of water (use 1 tablespoon of spices per cup of water) and 1 tablespoon of vinegar for every 2 cups of water. Simmer for about half an hour. You can either strain the juice in cheesecloth placed over a strainer or place the eggs directly into the pan with mashed foods. Dip each egg in a dye cup, and allow to sit for several minutes to absorb color. The longer the egg soaks, the deeper the resulting hue. Shorten the dye time to create pastels and lighter shades. Use a spoon to remove the egg from the dye. Wipe the water off with a paper towel, and place the eggs in a container, such as an empty egg carton to dry. Once you've finished drying the eggs, store them in the refrigerator.